Before the next superhero blockbuster arrives at the movies, a gap exists between Batman Begins and The Dark Knight which "Batman Gotham Knight" fills and explains the transition from novice crime fighter to Dark Knight. 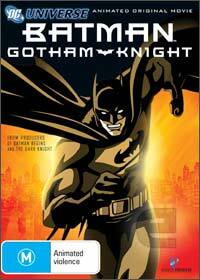 Based on the Animatrix premise, Batman Gotham Knight features 6 tales by acclaimed screenwriters David Goyer (Batman Begins), Josh Olson (A History of Violence) and Alan Burnett (Batman the Animated Series) which takes the viewer on a roller coaster psychological ride into the psyche of this pop culture icon. Best of all, the stories have received an anime makeover thanks to directors Yashuhiro Aoki, Futoshi Higashide, Toshiyuke Kubooka, Hiroshi Morioka, Jong-Sik Nam and Shoujirou Nishimi who lend their talents in making this quite an engaging tale of the man behind the mask. Although each episode can be watched separately, some are linked which assist in drawing you into the storyline. The first story involves a group of children who all recount their tale of meeting Batman from "Man-Bat" to a supernatural shadow that is a great way of explaining how society would view this masked vigilante. The other tales involve the Scarecrow, Killer Croc and Deadshot, all modified for that anime experience. Being a huge comic fan, I found this DVD a little mixed as a couple of the stories were a little flat and un-inspirational such as the "Robotic" Batman. However, the winner of this compilation is the first story with the children and the last story featuring Deadshot, a hired Hitman who never misses. Although this bridges the gap between the two movies, this DVD is more targeted for the comic fan but at the end of the day, it makes a good addition to the Batman franchise. Presented in an aspect ratio of 16:9 enhanced, the picture quality is quite impressive with sharp details and a varied colour palette. The sound also boasts Dolby Digital 5.1 surround sound which sounds simply phenomenal through our surround sound system that almost makes this like a movie-esq experience. Match that with engaging commentary by some of comics greats that include DC Comics Senior Vice President/Creative Affairs Gregory Noveck and former Batman Editor Dennis O'Neil plus the voice of Batman, Kevin Conroy who also voices the Dark Knight on this DVD, they really give you a unique insight into this character.